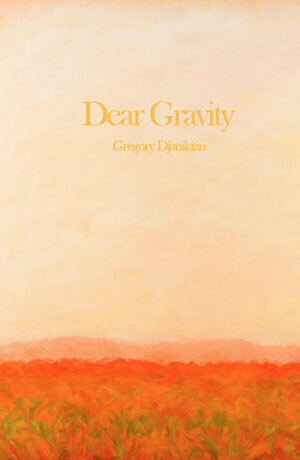 Gregory Djanikian has always been a poet of amazed appreciation, a man bedazzled by life’s bounty while acutely sensitive to its dangers, acutely aware of how love and humor help us endure life’s beguiling deluge, its “beautiful wreckage deepening.” In Dear Gravity all this comes across with the sweet generosity that makes Djanikian such an amiable and companionable poet. If you read Gregory Djanikian’s wondrous new collection—and you should—make sure you play close attention to the opening poem, “Violence”…[Its] imaginative range…deserves notice. Lest you think it is just a setup for another sequence of lamentations regarding life in the most technologically advanced civilization ever, rest assured that it is not the case. Rather, it is an overture that leads to genuine displacement—exile from Alexandria, Egypt’s legendary city, first to Beirut, thence to America—and from there to the adventures of high school and a new dialect…. Dear Gravity is, in fact, a celebration of life in all its inconsistency and contradiction, its puzzling admixture of chaos and bliss. Each of the book’s five sections comprises a thematic unit that picks up threads previously introduced, thus weaving an elegant and coherent whole….Djanikian reflects on social issues, relationships, family history, domestic life, and our connection to nature, always conscious of our place in the larger world….Perhaps because [he] realizes that “so much of the world/exists without us” (“So Much of the World”), he is at ease with the unsolved puzzles and mysteries of existence. [His} craft is so consummate it’s easy to overlook. Yet this very craft, from the careful organization of the book that gives the poems resonance to the line breaks that push the narrative poems forward but slow the lyrics so each line and image reverberates, makes these complex poems seem effortless. Poets will study this book to learn how Djanikian works such magic. All of us will read Dear Gravity to experience the way it renders our lives both familiar and strange. The poems of Dear Gravity are surprising, hopeful, heartbreaking, and clean. Djanikian’s poems remind us that language is the gravitational pull between the furthest reaches of imagination and real experience and memory, and these poems exist in and push at the limits of that intermediate space. Ultimately, memory and experience can be rendered only in language, and all that matters is who does the telling—or really, the writing. [T]he poems in Djanikian’s new collection…override the muck in the reader’s mind. They knock, step in, and stay. They assert the familiar in unfamiliar ways without relying on games or smug pretensions. They feel winnowed down, therefore essential, therefore as close to true as language gets. They are as accessible as they are quietly electrifying.